The Russian military personnel in Plesetsk successfully orbited a fresh satellite to replenish the nation's orbital navigation network. The 56th mission to deploy and maintain the GLONASS constellation lifted off on a Soyuz-2-1b rocket on June 17, 2018. 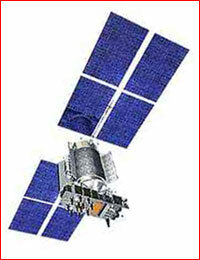 Like the other 51 GLONASS-M flight-worthy satellites for the GLONASS constellation, Vehicle No. 56 was developed at ISS Reshetnev based in Zheleznogorsk, Russia. Its assembly was completed in June 2014, but the spacecraft was initially allocated for a ground-based reserve. On May 15, 2018, the official TASS news agency quoted the head of ISS Reshetnev Nikolai Testoedov, promising the launch of a fresh GLONASS satellite on June 17 of the same year. According to Testoedov, the spacecraft, No. 756, was taken from a group of six backup satellites available on the ground, in order to replace Vehicle No. 734, which failed in orbit in the middle of April 2018. Although the nine-years-old satellite was reported to be back in operation by the middle of May, the preparations for the launch of the fresh satellite continued. In case of the successful deployment of Vehicle No. 756, its ailing predecessor would be re-classified as an orbital backup even if it had retained functionality, the Russian officials said. 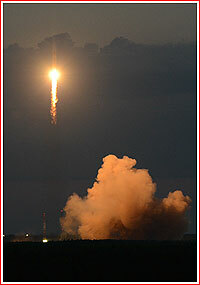 At the time, the overall GLONASS constellation was reported as fully operational. 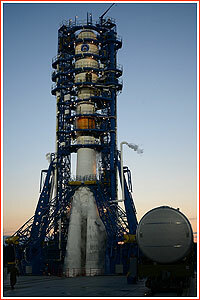 ISS Reshetnev announced that GLONASS-M No. 56 had arrived to Plesetsk aboard an Il-76 transport plane on May 22, 2018. Before its shipment to the launch site, the spacecraft underwent a series of tests, ISS Reshetnev said. 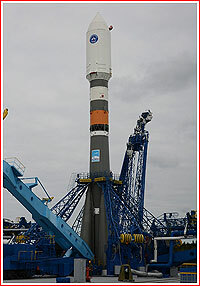 After the completion of standard processing, the fully assembled Soyuz-2-1b launch vehicle with the GLONASS-M No. 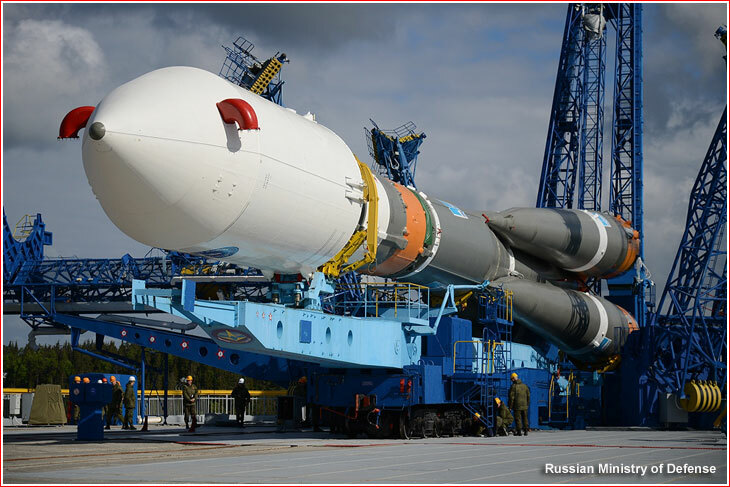 56 satellite was rolled out to Pad 4 at Site 43 in Plesetsk on the morning of June 14, 2018. The liftoff of a Soyuz-2-1b/Fregat-M vehicle took place on June 17, 2018, at 00:46:28.171 Moscow Time (5:46 p.m. EDT) from Pad 4 at Site 43 in Plesetsk. The rocket carried the GLONASS-M No. 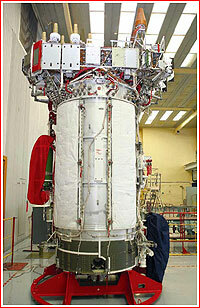 56 satellite for Russia's GLONASS navigation constellation. Several minutes after the planned liftoff, the official Russian media confirmed that the mission had been under way. The Russian Ministry of Defence announced that ground assets of the Titov Main Test Center had began tracking the rocket at 00:49 Moscow Time. Col. General Sergei Surovkin, the chief commander of the Air and Space Forces, oversaw the launch, the Russian Ministry of Defense said. After several seconds of vertical ascent, the launch vehicle headed southeast to reach an orbit with an inclination of 64.77 degrees toward the Equator. The four boosters of the first stage separated around two minutes into the flight and were expected to fall at drop zone S-19 in the eastern section of the Arkhangelsk Region. 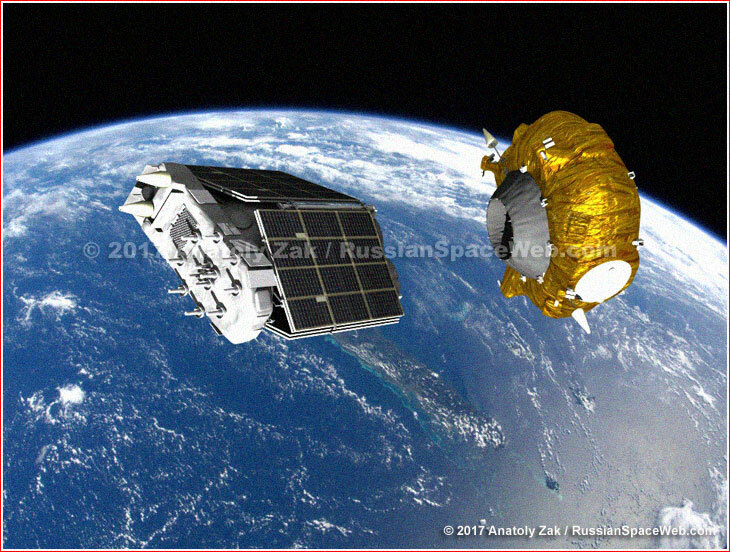 Around 45 seconds later, as the vehicle left the dense atmosphere, the payload fairing protecting the satellite was to split into two halves and its fragments then were likely impact the ground at the S-20 drop zone in the Komi Republic. The second (core) stage of the rocket continued firing until around 4.7 minutes in flight and it separated moments after the ignition of the RD-0124 engine on the third stage. Moments later, the cylindrical aft section of the third stage split into three segments and separated as well. The core stage and the fragments of the aft section were aimed to fall at the S-21 drop zone in the Omsk Region. The third stage of the rocket completed its powered ascent and separated from the payload section nine minutes and 22 seconds into the ascent. The third stage was then expected to reenter the Earth's atmosphere near the opposite side of the Earth from the launch site and its flaming remnants were projected to fall into the Pacific Ocean. Between June 8 and June 12, Russian authorities issued warnings to air traffic to avoid a long strip in a remote area of the ocean between New Zealand and Antarctica for the stage impact. 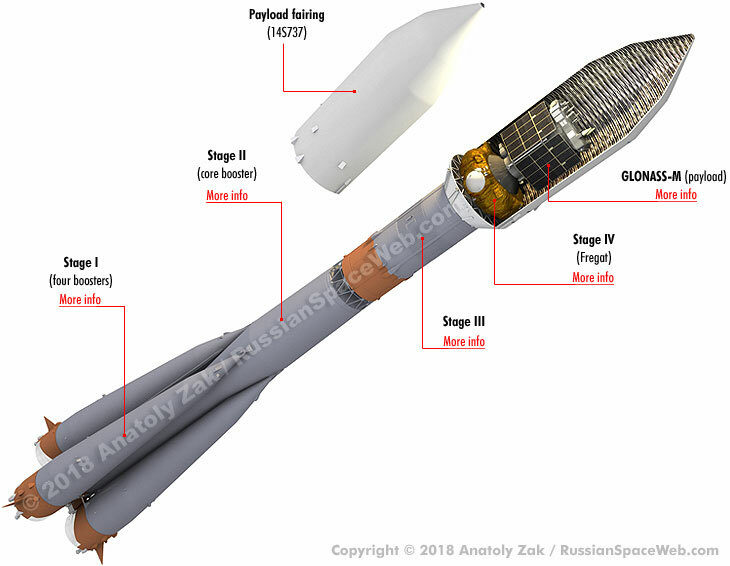 According to the Russian Ministry of Defense, the Fregat/GLONASS-M-56 stack separated from the third stage of the Soyuz-2-1b launch vehicle as planned at 00:56 Moscow Time on June 17, 2018, and successfully reached an initial parking orbit. In the meantime, the Fregat-M upper stage used its own propulsion system to deliver the spacecraft to the operational circular orbit more than 19,000 kilometers above the Earth's surface. The first Fregat's maneuver, lasting just around 20 seconds, inserted the stack into an initial parking orbit and after a less-than-half-an-hour passive flight, the Fregat fired again, this time for around 9.5 minutes. The second maneuver stretched the orbit to a target altitude of more than 19,000 kilometers, which the Fregat/GLONASS stack climbed for more than 2.5 hours before firing again. The third Fregat manuever, lasting just under four minutes, made the orbit circular, followed by the separation of the satellite around 30 seconds later. Shortly after the planned third engine firing, the head of Roskosmos Dmitry Rogozin announced that the spacecraft had separated and had been under control of ground stations. Upon the release of the satellite, Fregat was programmed to conduct two maneuvers with its thrusters to enter a burial orbit above its former satellite passenger. The Russian Ministry of Defense confirmed that this operation had been successfully completed. On the day of the launch, RIA Novosti quoted Director General at ISS Reshetnev as saying that GLONASS-M-56 would begin operations within the GLONASS network within a month. Testoedov reconfirmed that the new satellite was intended to replace the ailing vehicle No. 734. At the time, the GLONASS constellation was officially comprised of 25 satellites, including 24 in operation and one listed as undergoing flight testing. GLONASS-M-56 reached position No. 5 within the orbital constellation in the middle of August 2018 and declared operational on August 29. At the time, the GLONASS network listed a total of 23 operational spacecraft, two more were considered in technical service and one undergoing flight testing.